In the main menu, navigate to Activities>Calendar Events. In the grid on the Calendar Events page, click the ellipsis menu at the end of the row with the event you want to edit and then click the Edit icon. Update the event details as necessary. Follow the guidance provided in the Create an Event section. You may be prompted whether you want to send an update notification to the participants (if any). 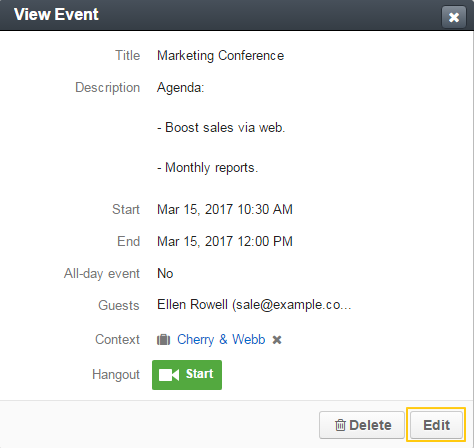 In the grid of the Calendar Events page, click the ellipsis menu at the end of the row with the necessary event and then click the View icon. Alternatively, you can click the required event. On the event view page, click the Edit button in the upper-right corner of the page. Update the event details as necessary. Follow the guidance provided in the Create an Event section (From the Calendar Events Grid, step 3). Entity records that are specified in the calendar event context have this call displayed in the Activity sections of their view pages. In the Activity section, click the ellipsis menu at the end of the row of the calendar event that you want to edit and then click Update Calendar event. In the dialog that appears, update the calendar event details as required. 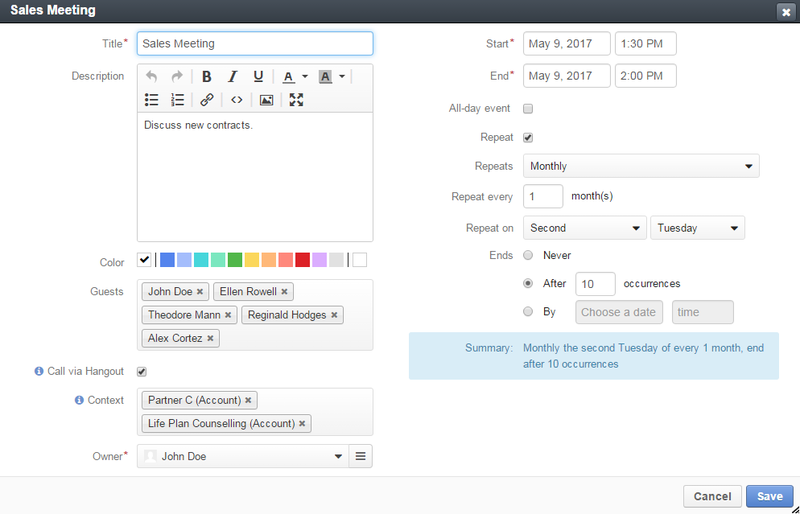 For the description of the fields, see step 3 of the Create an Event from the Calendar Events Grid action description. Click the event in the calendar. On the View Event card, click Edit. Continue as described in step 3 of the Create an Event from the Calendar Events Grid action description.